Although I enjoy Rick Springfield’s songwriting and music, that alone is not what makes him my favorite rock star. I like lots of music by many different artists, but stories like the one that happened last night make him my #1. Last night, he invited one of his longtime fans, an 18-year-old with autism, onstage to sing “Jessie’s Girl” – the teen’s favorite song – with him. After an eight-hour trek from Princeville, Illinois to Mt. Pleasant, Michigan on Wednesday with family members, Gavin Sibley attended RS’s Thursday show at the Soaring Eagle Casino and Resort. 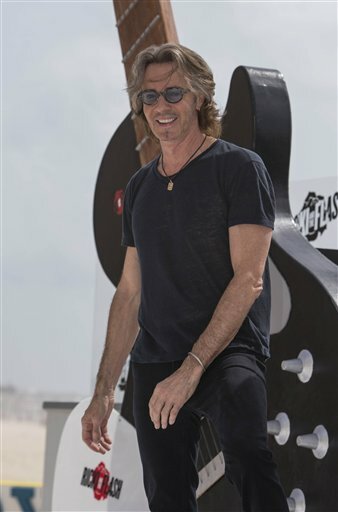 The trip, planned through the Make-a-Wish Foundation, included the concert, a meet-and-greet and a chance to play around with one of RS’s guitars. They found out the day of the show that Gavin would also be given a chance to perform his favorite song with RS. This kind of gesture of kindness is what makes RS so special. Besides next month’s release of Rick Springfield’s new CD “The Snake King,” it sounds like there might be some other cool RS offerings in 2018, too. In an article on oaklandpress.com, “Rick Springfield at Sound Board: 5 Things to Know,” RS mentions that his upcoming projects could include a prequel to “Magnificent Vibrations,” which started as a sequel, and a follow-up to his autobiography, “Late, Late at Night,” which came out in 2010. After learning so much about his life in LLAN, I think it would be so interesting to hear his perspective on the past seven years, too, especially after following his career so closely the past three years. It would be like those books where the narrator switches between characters so the reader learns what’s going on in everyone’s heads. I’m familiar with the fan view, now it would be interesting to hear the rock star’s point of view. He also talked about the inspiration for “Little Demon” in “Rick Springfield channels ‘The Snake King,’ “ an article on cantonrep.com. Plus, learning more about the theme of the album (from the cantonrep.com story) explains more about those titles. Since it’s been over a year since I’ve been to a RS concert, which means no show in 2017, I also hope that there will soon be a 2018 RS concert that I can look forward to. * “Last year” meaning the Rock Meets Classic tour March 30-April 18, 2017. In a second article, in the Midland Daily News in advance of his Dec. 28 concert at Soaring Eagle Casino and Resort, RS calls “The Snake King” an experiment. It is also a departure from the way things are usually done in the music business — heading out on tour to spread the word about a new album. The article also indicates that “that new music will be mixed in Springfield’s hits” so those lucky fans who are going may get to hear some of the new music at next week’s show. Springfield says retirement isn’t on the horizon. Well, we love what you are doing, too. Definitely will be interesting to see what the rest of “The Snake King” is like! For several weeks, guitar pics with the text “I Know What You Want” have been thrown into the audience during concerts and those words were also spotted on RS’s sling after his surgery and on a leather jacket. The other side of the pic said “The Snake King” so it was assumed that would be a song on the new album. But there wasn’t any “I Know What You Want” on the list of songs. The publicity so far for “The Snake King” has said that the album will be “rising” on Jan. 26. I haven’t heard that wording before as it pertains to an album, and because Rick Springfield is a writer who seems to select his words carefully (at least in his writing), I am thinking that the word was chosen for this album for a specific reason. So, why the use of “rising” for “The Snake King” instead of”drops” or “will be released”? Since we still have some time before the album “rises,” I thought I’d explore possible reasons. Religious implications: Judging from the song titles, there seems to be some religious elements so the “rising” can relate to Christianity. Political implication or world events: I don’t want to get political but so much has happened this past year that could provide inspiration to sing the blues. Maybe “The Snake King” rising refers to a change in leadership? Rising definition: ‘coming to the surface’ ‘appearing above the horizon’: Could refer to RS releasing some of his thoughts about things that he previously kept suppressed. Rising definitions: ‘reaching a higher position,’ ‘moving to higher ground’: Could refer to RS adding new heights to his career by publicizing his incredible guitar playing more than ever before. Rising definition: ‘reacting with annoyance or argument to’: A combination of #2 and #3, with RS not holding back on how he feels about things. Maybe the use of the word “rising” will be clear once we hear the whole album or maybe somebody can ask about it during the Q&A at an upcoming Stripped Down show. (If you find out, please share!) Or maybe we’ll never find out. But by then we’ll be so busy listening to the new songs, that we may forget about it anyway.